Decanter Centrifuge is important both for solid control system and waste management system. A variable frequency drive centrifuge can offer different speed for different use. Lower speed is better for barite recovery during solid control; higher speed can be OK to separate cuttings during waste management operation. Under current situations, well-known centrifuge brands are MI-Swaco, Derrick Equipment, Nov Brandt and a new star from China- GN Solids. The China brand GN reach the step of US brand with its core technology, excellent management and reliable after-sales service. Let’s compare one of US brand below with GN decanter centrifuge. 1. GN Solids variable frequency, electric drive decanter centrifuge, GNLW363VFD. GN Solids develop this model as per customer request. GNLW363VFD come out at right time. GNLW363VFD have been exported to many countries, the working performance has been tested by time and customer. So this model is mature and can be acceptable for many big companies focus on solids control or waste management. 2. MI-Swaco variable speed, hydraulic drive decanter centrifuge, Swaco 518HV. In order to overcome turbulence problems due to the higher flow rate the conveyor has a new configuration: a quasi axial flow. This has created a higher flow area and hence a low fluid velocity that limits the turbulence. The CD518 HV (High Volume) unit is an upgraded version of the precedent CD518 Standard centrifuge. Field tests in fact show that the new model delivers a greater performance than two standard units combined since it increases processing capacity and improves solids separation. The available power for both main and back drive is increased (main from 18.5 to 37kW and back from 7.5 to 11kW) as well as the internal diameter of the liquid discharge. Hydraulic drive centrifuge can be started in a very stable way. It is more smooth, steady and have less vibration. But once some spare parts have some problems, it will lead to much trouble. Compared with hydraulic centrifuge, electric ones can be amended easier, also very good price. 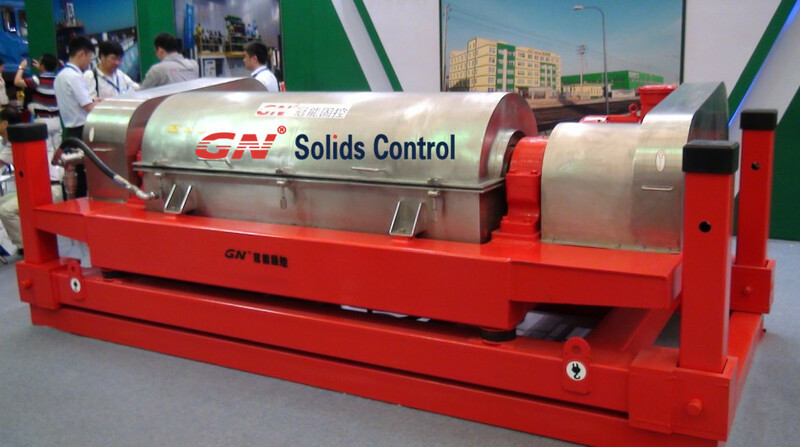 Any inquiry for separate decanter centrifuge or whole sets of waste management system, please contact GN Solids freely.